Glenmorangie means ‘valley of tranquillity’ in Scots Gaelic. In 1843, William Matheson founded the Glenmorangie Distillery in the Scottish Highlands. Inspired by the Distillery’s peaceful surroundings on the banks of the Dornoch Firth, Matheson brought forth a pioneering single malt whisky that is still to this day, wonderfully complex and exceptionally smooth. Glenmorangie celebrates the spirit’s unhurried journey to maturity, honouring the Distillery’s provenance in their award-winning single malt. Each taste recalls the hillside glen where the pure spring water is drawn, the calm of the Distillery nestled on the shores of the Dornoch Firth and the silent beauty of the homeland’s ancient Cadboll Stone, carved from the landscape long ago. In the year 297AD, the Romans discovered a proud and free race ruling in the North-East of Scotland. The Romans called them Picts, the painted people, as they decorated their bodies with inks and pigments. Their skin depicted the sweeping lines of the landscape and the colours of the sky. These people cultivated the very same fields that surround the Glenmorangie Highland home, where today the barley is harvested. The Picts carved their story into the Cadboll Stone, an ancient treasure that, with its intricate, highly skilled carvings, has become the inspiration for the Glenmorangie brand signet. Glenmorangie's own water source and most prized asset, The Tarlogie Springs, is the product of rain that has been forcing its way through layers of limestone and sandstone for a hundred years. These natural minerals give it its 'hard' water qualities and provide the distillery with a raw ingredient unique amongst Highland distilleries. Claiming the tallest stills in Scotland, the Glenmorangie distillery in Tain, Ross-shire, stands above the rest. Measuring 8 metres high, meaning only the very lightest and purest vapours make it to the top, giving a smoother, more elegant whisky. For years, Glenmorangie whisky was produced by a staff of only 16, known locally as The Sixteen Men of Tain. Now, expansion has increased the distillation staff size to 24, but the quality of the award-winning single malt scotch remains as fine as it has always been. The Glenmorangie distillery in Scotland produces some of the best single malt whisky in the world. 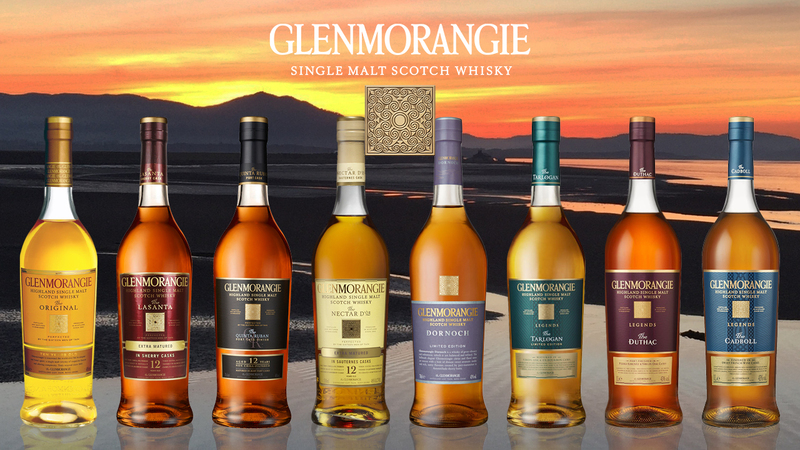 As Australia’s online supplier of the best Scotch whiskies, GoodDrop offers a range of both widely produced and collectable bottles that bear the famous Glenmorangie whisky name. Using traditional storage methods and a local spring water source, Glenmorangie whisky is widely recognized for its unique flavors that are reminiscent of the Scottish highlands and sea. The recognition extends internationally. Glenmorangie has earned more Gold Best in Class awards than any single malt Scotch whisky at the International Wine and Spirits Competition. Glenmorangie scotch ranks high among what critics consider the best whisky brands. Have questions about our beverages or services? Please visit our FAQ page, or contact us today at 1300 603 344. We look forward to supplying Glenmorangie whisky at great prices!